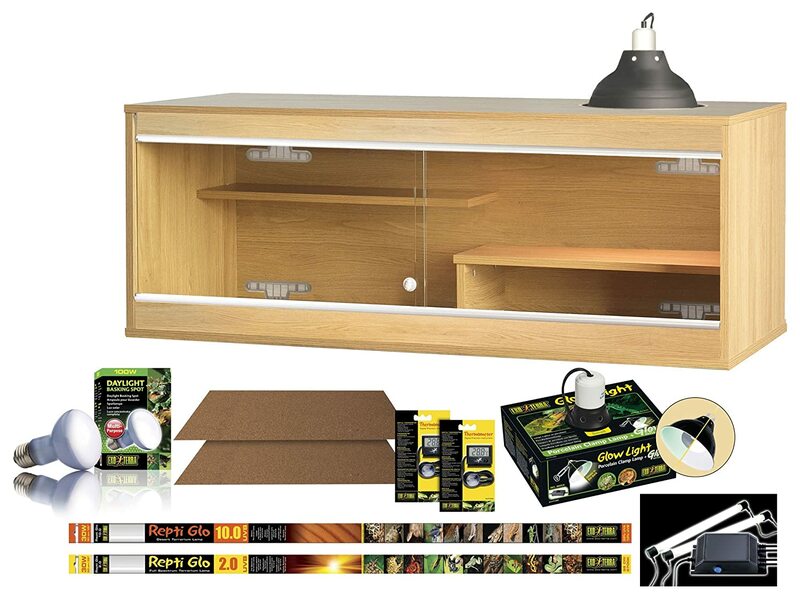 Wooden vivariums are a very popular choice for bearded dragon vivariums because they’re the cheapest option and it’s much easier to control the temperature of a wooden vivarium than any other type. 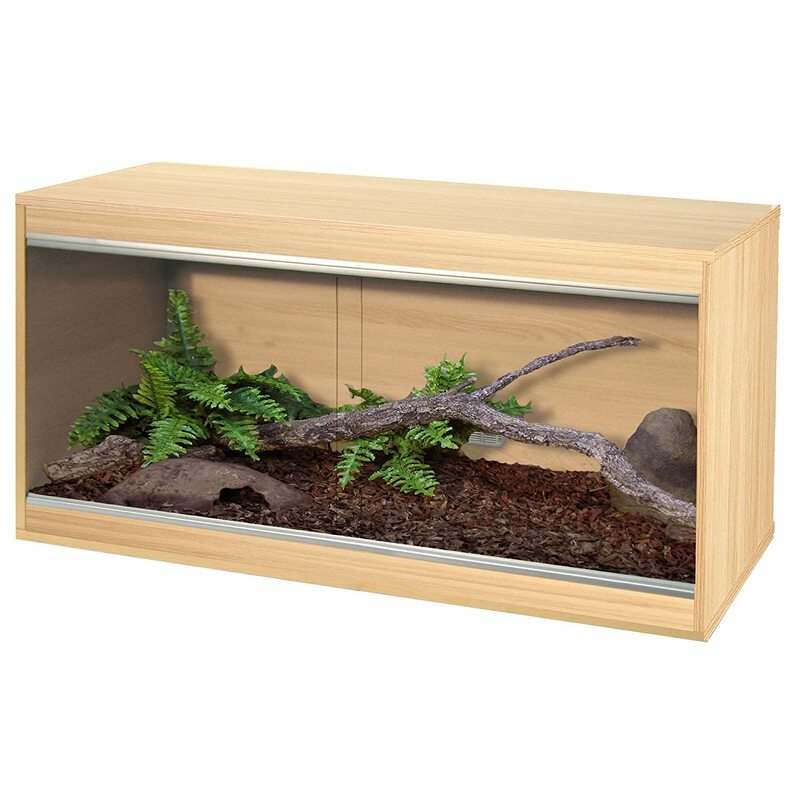 Most wooden vivariums have solid sides with a sliding glass doors at the front – like this popular wooden vivarium from the bestselling brand Vivexotic. 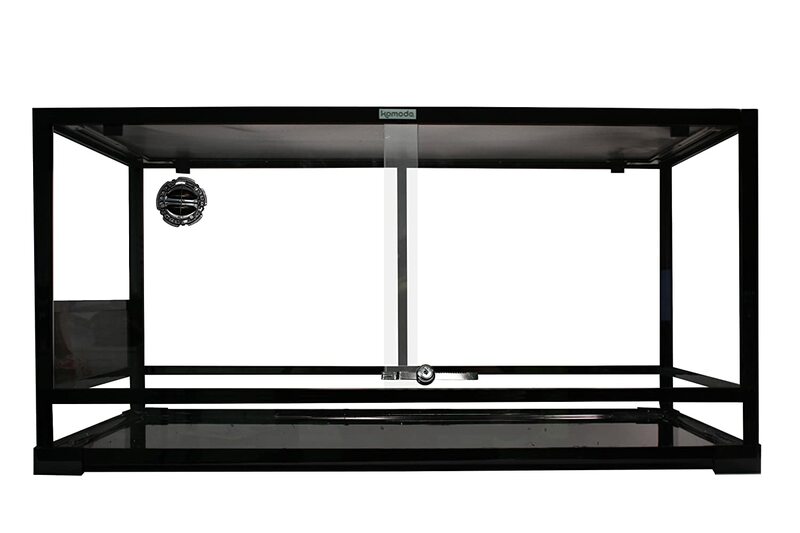 This lets you see what’s going on inside the vivarium while making your bearded dragon feel secure and keeping the tank well-insulated. 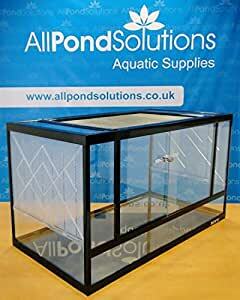 Glass vivariums are also a popular choice of bearded dragon tank. Also known as glass terrariums, they’re fairly cheap and readily available on sites like Amazon. The major advantage of glass vivariums is that you can see what’s going on inside your bearded dragon enclosure from all angles. Plus, they’re modern and will fit in easily with the rest of your furniture. Just bear in mind that they can be fairly heavy and don’t hold the heat as well as wooden vivariums. 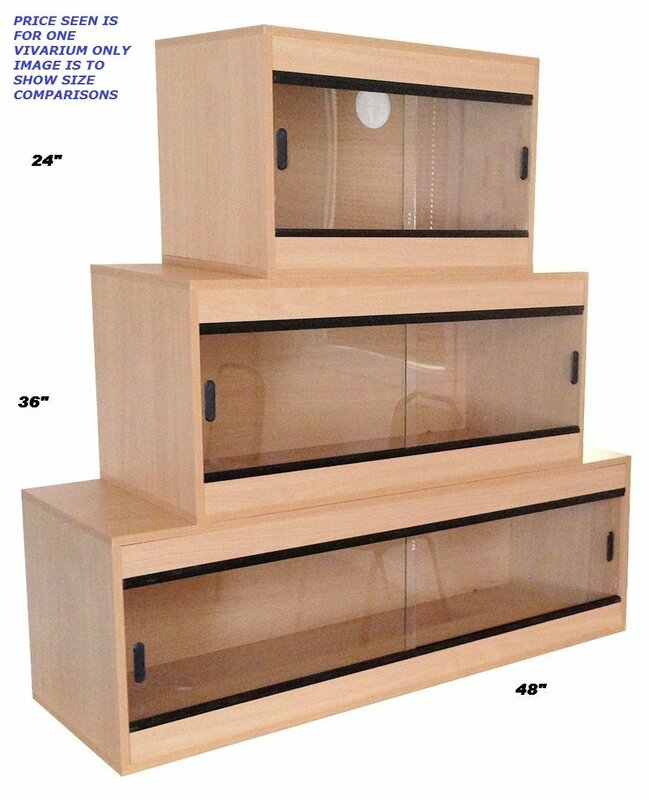 The next stage of your bearded dragon vivarium setup is choosing the right size vivarium. Bearded dragons are large and active reptiles, so they need a large tank. This will give your pet enough space to move around and make sure there’s enough space for you to create different temperature zones. Whether you’ve got a baby or an adult bearded dragon, follow our guidelines to make sure you choose the right size tank. 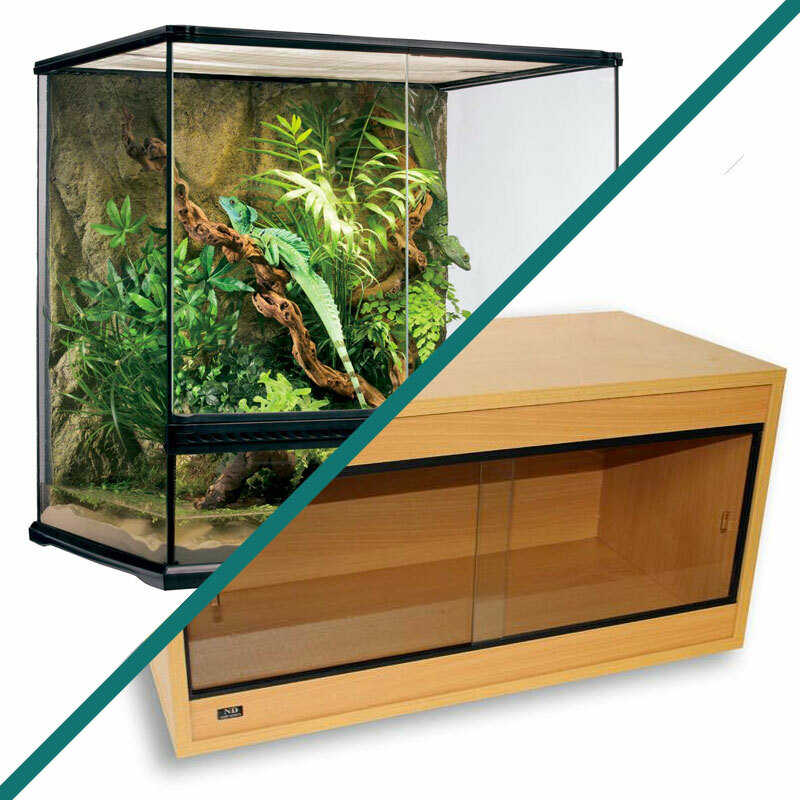 We’d recommend a 4ft x 2ft x 2ft vivarium for an adult bearded dragon – just like the ones below. 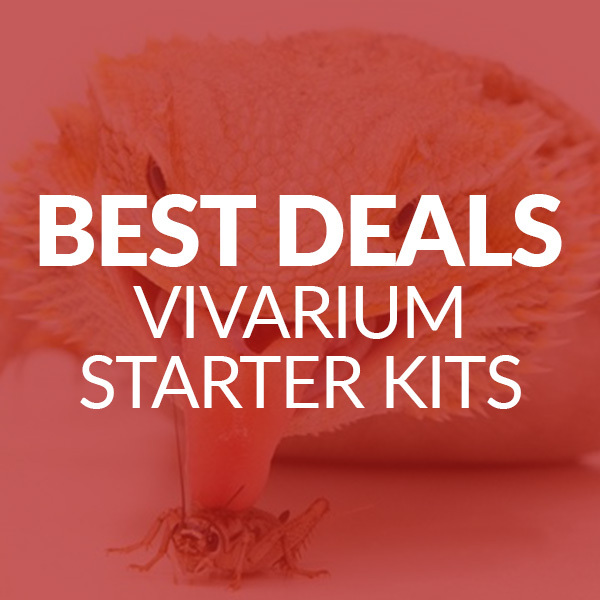 And remember, all prices on Vivarium World are automatically synced with Amazon so the price you see if the price you’ll pay if you decide to buy. If you’re setting up a vivarium for a baby bearded dragon, it’s fine to house them in a large vivarium that they’ll grow into (this will save you buying a new vivarium once your bearded dragon gets bigger). Just be wary that if the tank is too big, your baby lizard might not be able to catch its food. 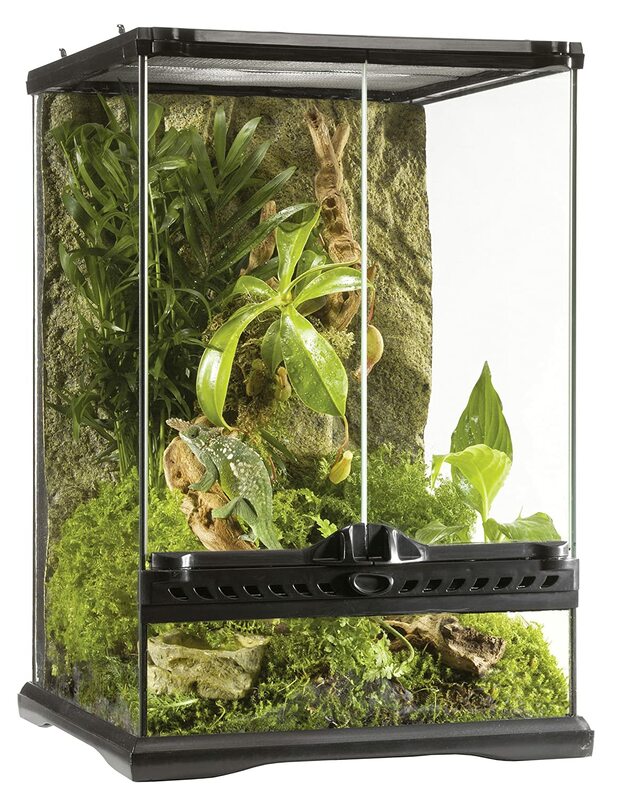 So as a compromise, you could go with a medium-sized vivarium like this until your bearded dragon gets a little bigger. 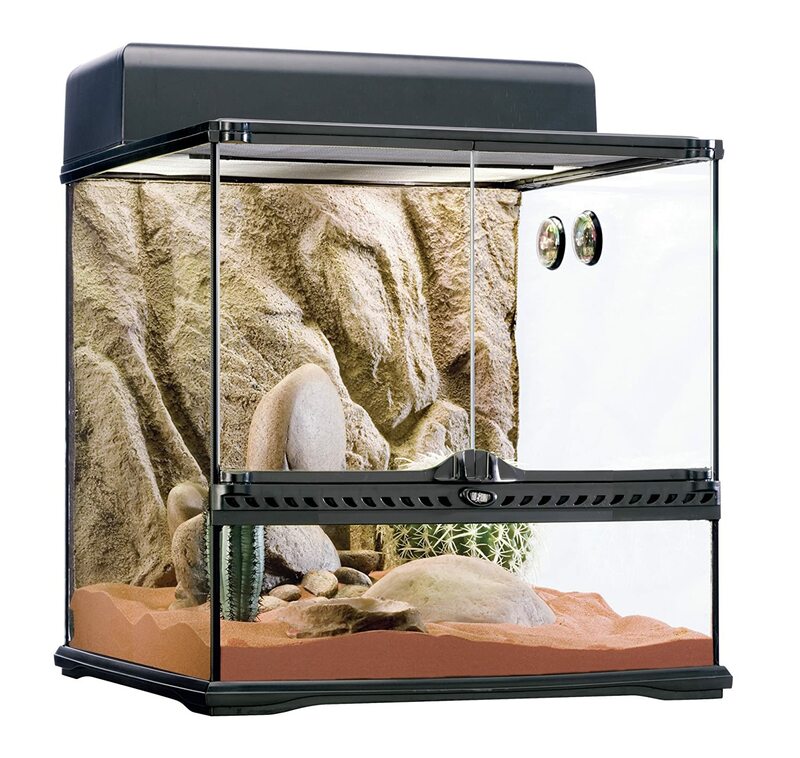 Do bearded dragons need a tall vivarium? Bearded dragons are semi-arboreal, which means they like to spend some time climbing. But don’t worry too much about getting a tall vivarium – it’s more important to give them plenty of floor space. After all, the aim of your vivarium is to recreate your bearded dragon’s natural environment and your pet beardie would have plenty of space to run around in the wild. As long as your tank has a little bit of height like this one, that should be fine. 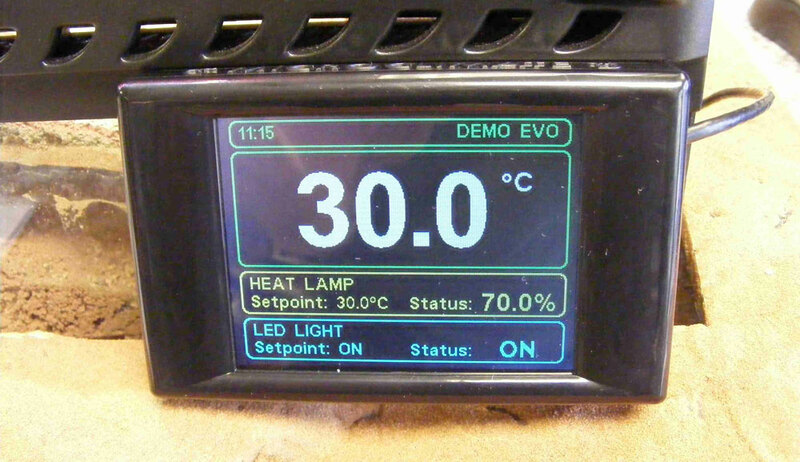 Once you’ve chosen your tank, the next step of your bearded dragon setup is heating. 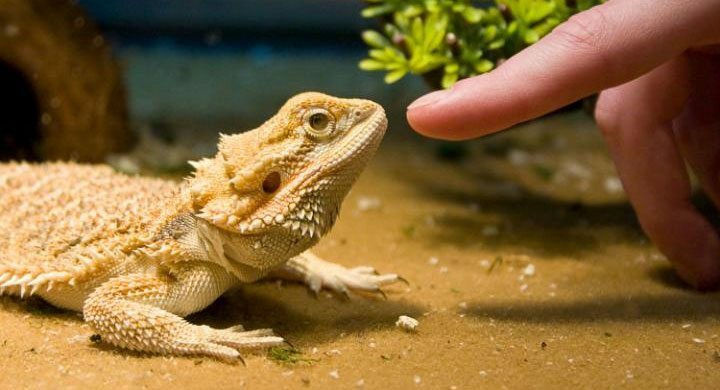 Bearded dragons are native to Australia so vivarium heating is necessary the temperature of their natural habitat. Follow our guidelines to find out what temperature your bearded dragon needs and which heating accessories you’ll need to create the right heating conditions. In their natural habitat bearded dragons spend their days basking in the hot Australian sun, so during the day you’ll need to use a basking lamp like this to provide heat. Stick to the top brands like Exo Terra when you’re buying your basking bulbs and you can’t go wrong. Overheating can be very dangerous (and potentially fatal) for bearded dragons so we’d also recommend using a thermostat to prevent the temperature rising over 45℃. ALWAYS AVOID heat mats and heat rocks as bearded dragons can’t feel heat through their stomachs, which means they can get burnt very easily when they’re lying on a heat mat. Unless your house is particularly cold (less than 18℃), you won’t need to provide any heating for your bearded dragon at night. In their natural habitat, they’re used to a nighttime temperature drop and this allows them to cool down. If your house is cold and you do need to provide some heat, we’d recommend using a ceramic heater like this that won’t emit any light and disturb your bearded dragon’s sleep. Bearded dragons come from the deserts of Australia, they need full spectrum lighting for 12-14 hours a day. They need light to remain healthy and it needs to be spread evenly throughout the tank with a branch or rock that lets your bearded dragon get 6-8 inches from the light source (to bask). Bearded dragons need UVA and UVB light to help them stay healthy. Even though UVA light has few benefits for humans, it encourages natural behaviours like basking and breeding in lizards. And UVB light is essential for the creation of vitamin D, without which bearded dragons susceptible to metabolic bone disease. Your UVA/UVB light should mimic natural sunlight and needs to be spread evenly throughout the tank. We’d recommend a long fluorescent light like this – get one that’s as big as will fit in your vivarium. 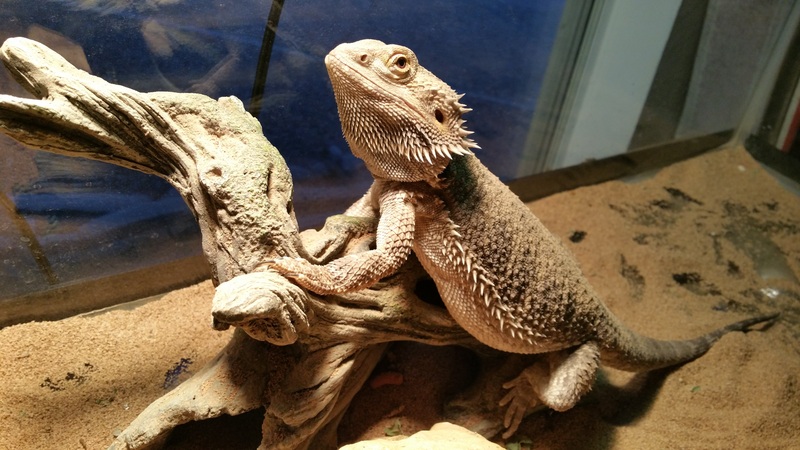 All UVB bulbs have different levels of radiation and for a bearded dragon you need to choose the highest level of radiation – one like this would be perfect. Just remember that UVA/UVB bulbs lose their strength over time so you’ll need to replace it roughly every six months. A basking light is important because it will provide heat to your bearded dragon; it’s not really needed for light. You should place your basking light at the far end of the tank so you can create a thermal gradient – find out more about this in our bearded dragon heating section. As for the type of bulb, we’d recommend something like this. Substrate is the bedding that you put along the floor of your vivarium. It’s very important to choose the right substrate for your bearded dragon because certain substrates can be ingested but won’t pass through, causing a fatal condition called impaction. Vivarium decorations help create a nice environment for your bearded dragon. You can choose a few basic decorations or really go to town – it’s up to you. As long as your bearded dragon has somewhere to climb and relax, they’ll be happy. 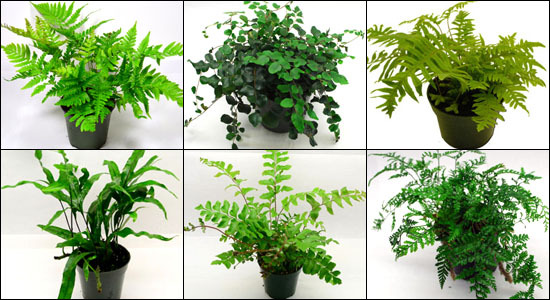 We’d recommend a selection of plants, logs, rocks and hideouts. You could even create your own rock background. Amazon has a great selection of decorations – have a go at mixing and matching to create a unique setup. Bearded dragons are omnivores so they eat both plants and animals. A baby bearded dragon diet generally consists of 80% bugs and 20% plants while an adult bearded dragon’s diet is the opposite – 20% bugs and 80% plants. Like any reptile enclosure, it’s very important to clean it regularly. Bearded dragons have particularly smelly dung, so it’s very important to change the substrate and remove faeces daily. Other cleaning tasks need to be carried out every couple of days or once a week – take a look at our vivarium cleaning guide to help you stay on top of your daily and weekly cleaning schedule.